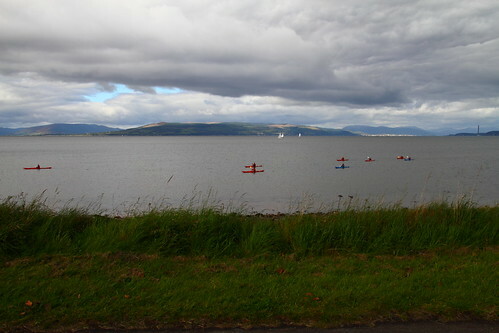 An hour by rail, and five minutes by ferry, and we were away to Great Cumbrae. 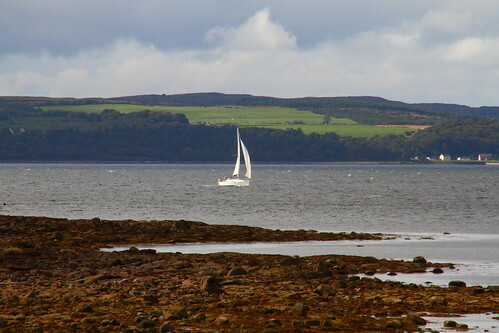 The water surrounding Great Cumbrae is so clear that we could see the bottom of the bay all the way across to Largs. That was just … unbelievable to us. 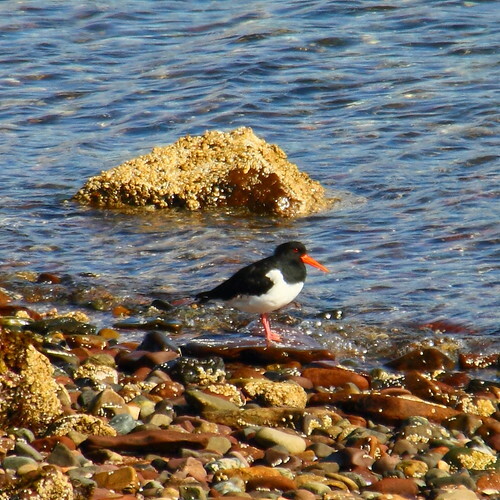 The place attracts hordes of shorebirds who dive and dip, feasting on their very visible prey. 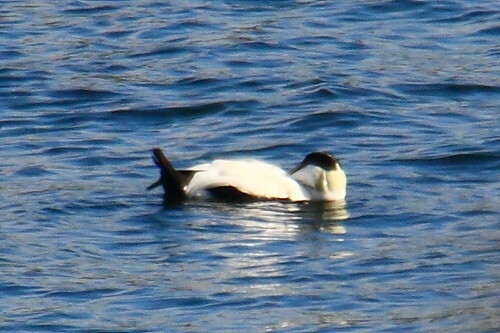 Eiders and Oystercatchers seemed pretty happy. 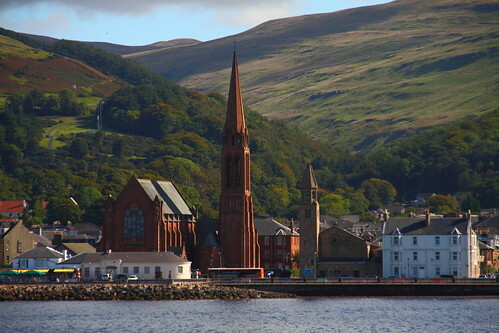 Great Cumbrae Island is actually …little (Great Cumbrae is the mountain in the middle of the island, and plain old Cumbrae Island is in New Zealand). It’s ten miles around, and we intended to walk at least halfway, having been told that the best berries were on the lee side. 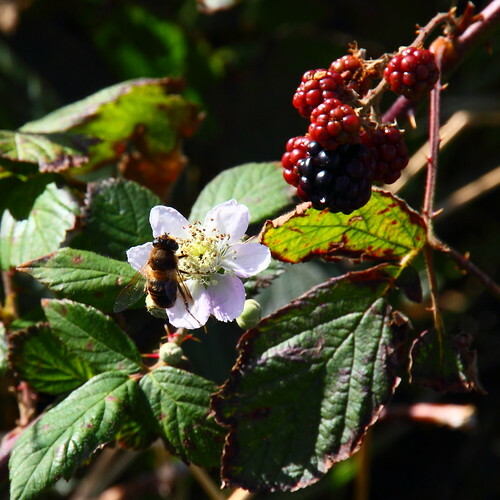 We didn’t get more than a mile around before we stopped at a bramble alongside of the road, and found small, ripe berries. Our friend A. – we’ll call him Axel today – started sampling. “Not good enough,” he told us, licking his fingers. We shrugged and kept going. It wasn’t all sweetness and safety. Between the sliding rock wall (Note: one should not brace one’s foot on any rock wall before checking to see if it’s actually going to hold one’s weight), spiders running up T’s sleeves (the small shriek that rent the air went largely ignored by the island populace, except for those who quietly went deaf in the near vicinity), the vicious bramble thorns and the discovery of the stinging nettle (thank you, Prairie Girl Wanderer – we remembered that blackberries and nettles go vine-in-vine), there were some yelps, whimpers, and the occasional muttered imprecation. We would have used the natural remedy of the dock plants growing nearby, but mostly we didn’t see the nettles we ran into, so were a bit frustrated. However! All these things were minor. 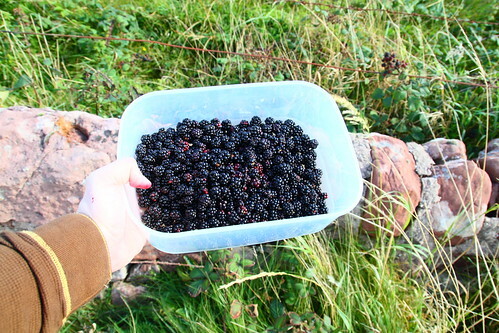 We came away with a good eight quarts of berries, and visions of blackberry jelly dancing in our heads. 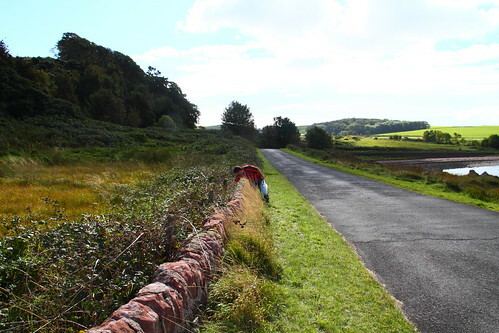 This being Scotland, eventually our lovely, sun-drenched idyll came to an end — and considered becoming just a drenched idyll. We picked faster. Axel even stopped eating. Briefly. 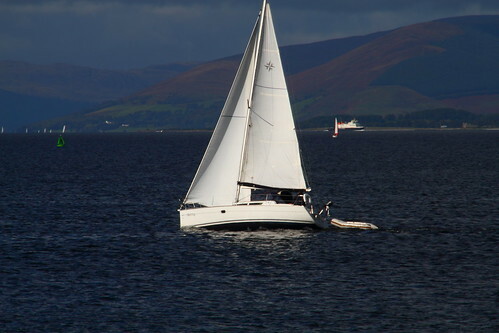 We hurried back about two and a half miles to the ferry and boarded before any rain began. 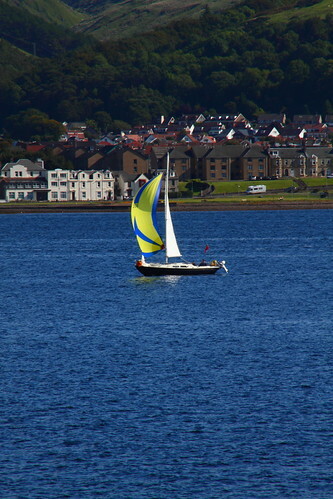 It was a gloriously near-perfect day, and will remain one of those treasured memories we hoard for bleak winter days. Thanks for bringing me along…in spirit. I do miss the ocean, desperately sometimes. Those blackberries look absolutely awesome!!!!!! I am so jealous after having to pay $3 for a miserable little container from Safeway…love the orange beaked shore birds who remind me of the little noisy finch nuisance varieties that I have here. So glad you had a lovely time!!! !